How does a teleprompter work? If you are unsatisfied with your teleprompter, please ship it back to us in like-new condition within 30 days of your purchase, and we will refund the amount you paid for it. Please feel free to contact us, and we'll be happy to help however we can. Click here to log in or sign up for our affiliate sales program. 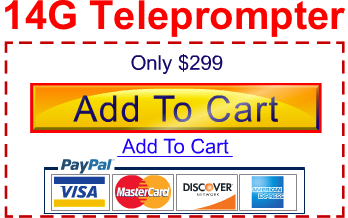 You can earn a commission for every teleprompter you help us sell!